TBT, we did this 25′ tall Dannon cup around 1995. All hand painted before digital printing was even around! We would have to project and pattern it on a wall then transfer it to the fabric and paint it before was sewn together. Giant Balloons for Sea World! We just finished these giant balloons for Sea Worlds new evening show. They are completely digitally printed allowing internal illumination that gives off a wonderful glow through the brightly colored fabric. For the all new Electric Ocean Nighttime Celebration Sea World decided to use giant inflatable balloons. Along with updating the Cirque water show they wanted to spice up the different areas of the park with bold and interesting new props and color. After spending time with their creative team we came up with a series of 10 – 10′ tall inflatable anemones that would be installed on the roofs of different buildings throughout the park. The size and shape made a wonderful and whimsical impression and after being internally lit was a real hit among the attendees at Sea World. Dancing sky tubes or dancing tube men, whatever you want to call them are an attention getter that gives a ton of ROI. Relatively inexpensive they get your customers eyes on your offer or service. For business owners that need more customers they are a no brainer that will bring people through the door. For years we have been painting logos and text onto color fabric because it as the “only way” to get those images onto giant inflatables and giant balloons. No more! 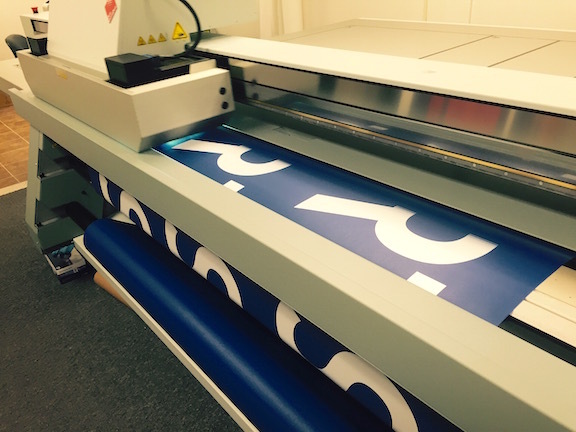 We can now print those images using our large format UV printer with its roll-to-roll feature. This is a wonderful step forward for you, our clients, to make your advertising tools look the best! So if you have a need for graphics onto color media of all kinds give us a call! Our UV flatbed printer with a roll to roll feature printing onto color fabric. 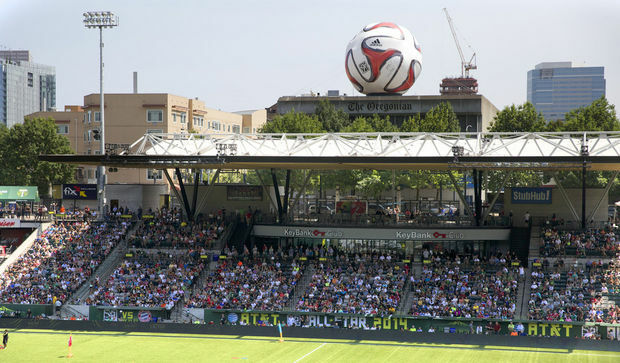 Giant Inflatable Soccer Ball for MLS! Soccer ball for the MLS all star game. We’ve been in the new place for about three weeks now and thought you would like to have a little tour. The first thing you’ll notice is that the front office is a totally open concept—it really makes the area feel a lot larger than it is! At the back end of the office is our large production table where all of our signs, retractable banners, posters, and cut vinyl for vehicle graphics are put together. We have a middle section room which is where our three large format digital printers are located and are used for giant inflatable printing, signs, banners, feather banners, and decals. They are in a controlled temperature environment which a big plus for ensuring good results with our prints. 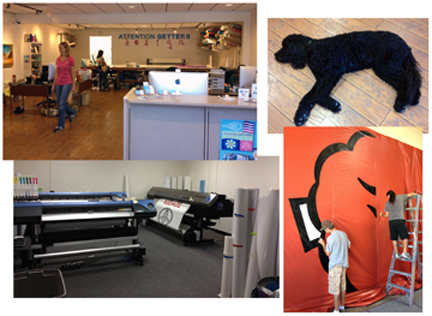 The third area is home to our media cutting machine and the liquid laminator we use to make the digital prints for inflatables scuff-proof. And finally, the warehouse in the back is used for wet painting of inflatables and vehicle graphic installation. Moving gave us a great opportunity to recycle and ditch unneeded and unwanted stuff that hung around for years. As a result, our new place is much better organized than the last place.